The Anglican Church has put out a call for anyone with information about the final resting place of Mr Charles Shepherd to come forward. Mr Shepherd, a reclusive Proston grazier who died in 1935 without any heirs, donated the funds to have St Peter’s Church built in Proston in the late 1930s. Church records along with a plaque inside the building indicated his body had been buried underneath the church at his request after construction was completed. But when Bishop Cameron Venables searched for the body on Saturday afternoon, he came up empty-handed. “There was no sign of it in the crypt, and no sign of it anywhere else underneath the building,” the Bishop said. “There don’t appear to be any records indicating he was interred in any other local cemetery either. Church officials are searching for the body because after St Peter’s was deconsecrated on Saturday, they need to ensure any remains are removed from the grounds and formally reinterred elsewhere. Proston’s Shepherd Memorial Church of St Peter – which some people believe is one the most beautiful churches in the South Burnett – was designed by architect Joseph Fowell from the Brisbane firm Fowell, McConnel and Mansfield, and built by Lesleigh Smith from Wondai in 1939. Fowell designed the church in a Romanesque style with both European and Scandinavian influences, and it was finished with high quality face bricks specially moulded by the Wondai Brick and Tile Company. It features a bell tower; an elevated organist’s platform midway up the tower; a cavernous interior; a spacious altar; and a brick lectern. 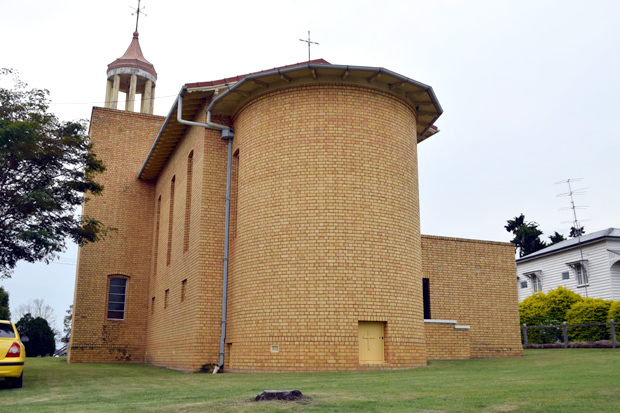 The church is located on the corner of Drake Street and the Wondai-Proston Road near the turn-off to Lake Boondooma, and has been a striking architectural feature of Proston for more than seven decades. The architects received a Royal Australian Institute of Architects Queensland Meritorious Architect Award (Country Division) in 1940 for their design work. In 2012 the building was also given a heritage listing and entered into the Queensland Heritage Register. At that time, Queensland Heritage Council Chair Professor Peter Coaldrake said the Shepherd Memorial Church had been listed on the Register because it was a fine early example of modernism in Queensland church architecture, an architectural style not popular for churches until after World War II. “St Peter’s Memorial Church remains largely unchanged since it was built in 1939,” Prof Coaldrake said. The closure of St Peter’s church after 76 years of continuous operation was made at the request of the Barambah Parish Council. St Peter’s church is one of five in the Barambah parish, and its closure was prompted by a combination of declining congregation numbers and the church’s recent moves to centralise services in major population centres to better reflect the demographic changes and improved transport links of the 21st century. The closure follows the deconsecration of St Paul’s Anglican Church in Kumbia on October 14 for similar reasons. St Peter’s is also the second church closure to occur in Proston this year. 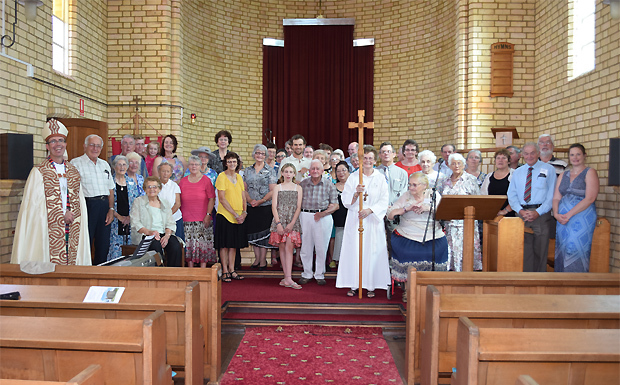 Proston’s Uniting Church held its final service on August 9. 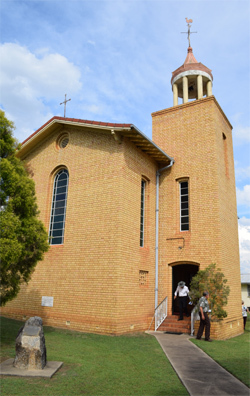 Nelda Seng, a member of St Peter’s congregation, said many members would continue to worship at the town’s three remaining churches – the Catholic Church, the Baptist Church or South Burnett Ministries. Others would commute to Anglican churches in Wondai or Murgon. Apart from the mystery of where the patron of St Peter’s church is buried, Saturday afternoon’s service went smoothly. 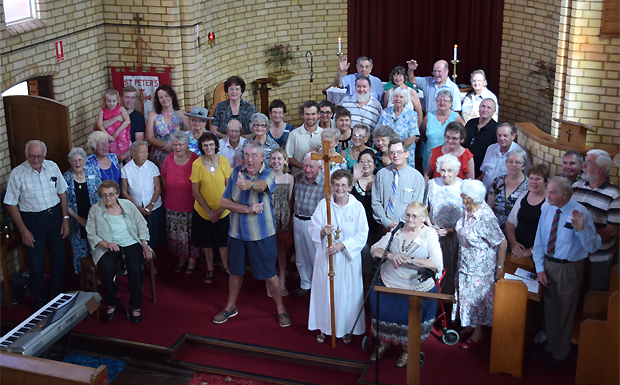 About 50 worshippers from Proston, Wondai, Murgon and surrounding districts attended the final service to sing hymns, take communion, witness the passing of the processional cross to the custodianship of the Parish Wardens and say prayers. Guests included members of the Lutheran and Uniting Churches as well as many local Anglicans. Bishop Venables, who travelled from Toowoomba to lead the final service, said it was understandable some in attendance would be experiencing a sense of loss. “To many of you, this building has been hallowed by cherished memories of births and christenings, marriages and funerals,” he said. “But you should be comforted by the knowledge the presence of God is not tied to any one place or building. Afterwards, guests gathered for afternoon tea and fellowship at the Church’s hall immediately behind the building. 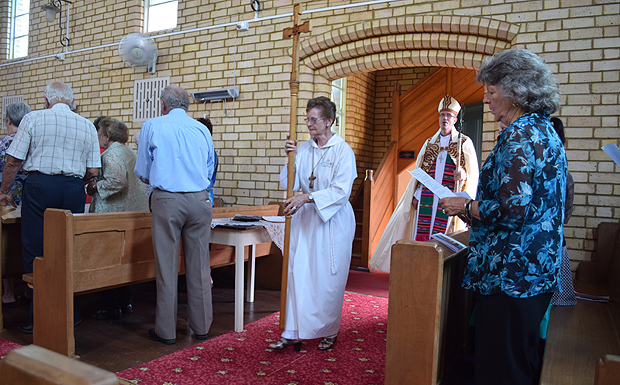 On Sunday last the new Church Of England was officially opened and consecrated by the Archbishop of Brisbane Dr. Wand. Unfortunately the day was cold and bleak, but this did not affect the attendance to any great extent, the church being filled to overflowing. The Archbishop blessed and consecrated the font, chancel, lectern, pulpit and altar. The service was most impressive and was followed by the celebration of Holy Communion. In his address, the Archbishop stated that the design of St Peter’s was a distinct departure from the usual design of churches in the diocese and in his opinion the design was beautiful and courageous and unlike any church he has previously seen. He further stated that the ceremony was most unusual as even in Australia where new churches were being rapidly erected, it was very unusual for the consecration ceremony to be performed at so early a stage of the building’s life. This was a permanent structure and owing to the munificence of the late Mr Charles Shepherd could be consecrated immediately. The Archbiship was assisted in the ceremony by the Rev. A.S. Dence, vicar of the Wondai-Proston parish, and the Rev. Lee Warner, of Murgon. Brisbane, Tuesday – By the will of the late Mr Charles Shepherd, who died at Proston in the Wondai district on June 7, the Anglican Church in the district will benefit to the extent of 10,000 pounds. Mr Shepherd had lived practically as a recluse and had never been associated with any public or church work during the many years he was in the district. Until taken to hospital, he lived in a lonely hut on his grazing property. He was 72 years of age and had no relatives. The Anglican Church in the Wondai-Proston district will benefit by a bequest of 10,000 pounds under the will of the late Mr Charles Shepherd, who was a grazier residing on a property near the Stuart River, Proston district, died on June 7. It is understood that apart from two small legacies he left his entire property to the Church. Have to wonder where the money went, the church claimed he only left them 7,500 pounds it cost 3000 pound to build and furnish the church and the balance was to be invested in government securities yet the church claimed the interest would not be sufficient to maintain the parish. Charles was buried in the local cemetery, then in 1937 his body was removed and placed in the church grounds and was supposed to have been reinterred under the “sanctuary”. A copy of his will and the order for his reinterment is supposedly in a cavity under the foundation stone. Yes, as I understand, a few days prior to the laying of the Foundation Stone, Mr Shepherd’s remains were moved from their grave at the Old Proston Cemetery and reinterred under what would be the sanctuary of the new church when completed. Re the money – of the 10 thousand pounds left to the Wondai District of the Kingaroy Church of England Parish, 3 thousand was to be utilised for the construction of the church at Proston. I recently spoke to former Proston resident, Mr Eric Cridland, who turned 100 yrs on 12th November. Mr Cridland now resides in “Castra” retirement home in Murgon. He assured me Mr Shepherd’s remains were relocated to the church site and that he and another long-time Proston resident, Mr Doug Reinke, were pall bearers on this occasion. Sadly Mr Reinke passed away earlier this year. Thus there is at least one eyewitness to the relocation taking place. I understand the floor of the crypt is concreted so it is entirely possible that Mr Shepherd’s remains are located beneath this if the relocation occurred during the construction of the building. Surely there are official records of the initial burial and the relocation which would have to have been carried out through official channels? I believe the English tradition was to bury people under the aisle of their churches. Perhaps that is why there is no sign of a coffin, as it would be buried in the soil under the floor while it was being constructed. Could this be an explanation?